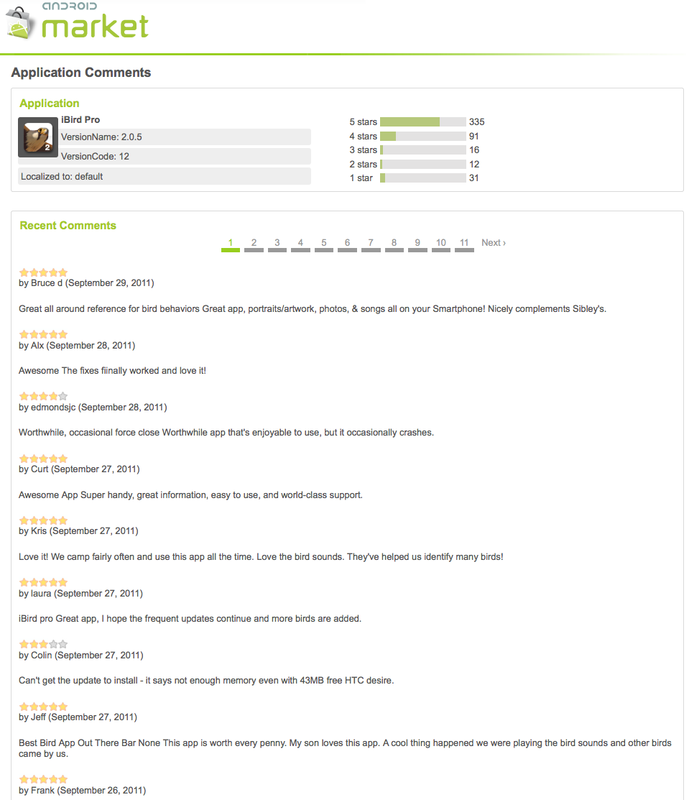 Just to keep you updated on how our customers are feeling about the iBird for Android product here are reviews from the week of 9-29-11. Click image below to see full size. Before you dive into this FAQ I want to give you a word of caution and congratulations. As an Android owner you are a very brave soul. I say this not tongue-in-cheek but in all total seriousness. As publishers, the Mitch Waite Group has been developing mobile software since the first Window’s platform was launched over seven years ago. We have since dealt with every major mobile platform including Apple iPhone, RIM Blackberry, and now Android for smartphones, tablets and television. It is our unanimous conclusion that there is no more complex, perplexing, hair-pulling, powerful, or obtuse operating system on today’s market then the Android OS. This is not a criticism, because along with this complexity comes incredible power. But we want to warn that as you venture into these frequently asked questions and answers keep in mind that as one of the chosen few you need to maintain a Zen-like state of calmness and patience, lest you find yourself cursing at Google and hurling your phone or tablet into the wall. In many ways Android reminds me of the early days of the personal computer, when people using them were considered pioneers and hobbyists and had to exercise great patience to keep their computers working. We suggest you find yourself a user group or online community of people that own the same device as you and turn to them for support when the going gets tough. We will do our best to be sensitive to how difficult getting some apps to run on the Android is, but we are not psychologists or priests so please try and exercise some patience with us too. There is a FAQ we developed for the first version of iBird 1 for Android which can be found here: http://bit.ly/ibird_android_faq While this FAQ is in the process of being updated it may provide information which will help you with you new update to iBird. It contains many more questions and answer then you will find here. This FAQ, which is being presented as blog post, is the start of a second FAQ specifically for the new iBird 2 for Android. Its purpose is to you install iBird on your tablet or smartphone as well as to help you solve problems other problems you may encounter. It starts with the most common problems people have told us they are dealing with. If you can’t find your answer here please write to us as the email form at Contact iBird Support. I get a message “iBird cannot function without an SD Card” and I can’t install the app. If you get this message and you know your SD Card is installed and has room on it for the iBird database or your device doesn’t use an SD Card it usually means there is a connectivity problem accessing the internet. Open the browser on your device and make sure you can connect to the Internet, for example type http://www.google.com and make sure the page comes up and the links on it work. If you can’t connect to Google try turning your WIFI off and on again (Settings->Wireless and Networks->WiFi ) Uncheck and then recheck the box. Make sure it says Connected to [your wifi network name]. Then try again to connect to Google with your browser. Until you can connect to the Internet with a fast WiFi you will not be able to install iBird. Once you can connect to Google try installing iBird again. I’ve reinstalled the new iBird update but I’m still having some problems with the program and I need your help. Every time I use the sync function, even if for only 1 bird, the program begins to sync, but gets caught in a loop and tries to sync the same images over and over again, never completing the task. This is usually because there is a bad database file in the iBird database folder left over from the previous install. The best solution to fix this is to delete the iBird database folder which is found on your SD Card, or storage memory if you dont have an SD Card. To delete this folder you are going to need to use a third party file manager program. You can get many from the Google Market. My favorite is the free Astro File Manager. Once it is installed Force Close iBird from the Applications settings. Then open the File Manager and locate the database folder for your particular version of iBird. Here are the names. Once you found the folder hold your finger down on it and a menu will appear. Select Edit. Then select Delete. There will be a delay as the File Manager computes the size of the folder’s contents, so be patient. Pro takes the longest. Tap Yes when you are asked if you wish to delete the folder. Now return to your iBird app and make sure it is NOT running in memory by doing a Force Close. Then make sure you have a good internet connection by connecting to google.com. Now start iBird and it will detect that there is no database and give a message that it is downloading a new one. This is stage one of the process where iBird downloads the sqlite database called WingedExplorer.db and and sets up the folders for the image and sound files. Next you will get the Registration screen. Tap Later, Register or Never and you should finally see the full set of icons for your app and be able to scroll though them. Now you are ready to sync so go to the More page and select Synchronize so that iBird can download the image and sound files. These files are on a high speed server called a CDN so they should go very fast. If they dont it could be your Internet is slow or your device is old and has a slow radio. Why is iBird taking FOREVER to download the database of bird images and sounds? This is one of the biggest issues with Android devices. In working with dozens of devices over the years we have discovered that they are prone to many more connectivity issues than other mobile platforms. Loss of the WIFI connection is one of the most frequent issues as well as very slow WIFI bandwidth. While our iBird database is on a very fast server if the WIFI radio in your smartphone is a poor one, the download will go very slow. The newer phones and tablets have much less of a problem with connectivity. So if you find that syncing is taking a long time, here are some places to look at. Don’t use your cellular network for downloading iBird’s database. It’s way too big and the cellular network is slow. Check the speed of your WIFI from your device. Download the free speedtest.net mobile app and use it to measure your WIFI bandwidth. The download speed should be above 1000 kbps (1 mbps) to get good download speed. Reboot your router. Do this when you find your can’t connect or your download speed is really slow, or the number of bars on your WIFI icon are 1 to 2 instead of a strong 4 to 5. In your settings, under “sound and display” set your screen timeout for as long as the device will allow. Please note that android devices will often drop the WiFi signal during downloads so you need to keep an eye on that and reconnect if it is dropped. When I try to update update iBird I get a message “Sorry, there’s not enough space to install this item”. My phone says it has 228MB of App Storage, 1.38GB of Internal Storage, and 2.87GB on the SD. That should be enough so what the heck is going on here? iBird’s requirements for memory are a bit more complicated than a typical Android app because there are TWO areas of memory that are required. The app itself, which is what you download from the Android Market, is typically–but not always–stored in what is referred to as phone memory, app memory, or other names. The database, which is very large (550 MB for Pro) is always stored in what is referred to as storage memory or SD memory. Here is what you need to do to get iBird to fit on your phone or tablet. App or program memory is a type of fast RAM (random access memory) which is very fast and small in size. Because it is so fast it is devoted the running your programs. It can vary in capacity from as small as 64MB (in older devices) to as much as 512MB (in newer devices and tablets). Most but not all Android apps share App memory so if you have many apps it is not unusual that they won’t all fit. If this memory is full when you try to install iBird you may receive the message “Sorry, there’s not enough space to install this item” it means most likely that there was not enough room in program memory to store the iBird app. There are two solutions to this problem, explained next. The message “Sorry, there’s not enough space to install this item” refers to the iBird app itself NOT the large database. If you receive the message “Sorry, there’s not enough space to install this item” your first solution is to see if you can move the application from program (app) memory to storage memory or your SD Card. By default iBird always tries to install the app to SD Card or storage memory, however the final arbitrator of where iBird is installed is up to your actual device, not us as developers. Yes I know there are other apps that always install to SD Card memory but again it is not totally under our control. There are things about the way each app works that controls if it can be run from storage memory. In some cases storage memory is too slow. The point is we as developers can only suggest to the OS where to put iBird. To see if you can override where the iBird app is stored go to the Settings->Applications->Manage Applications menu and tap the iBird application in the list of apps. You should find a button called Move to Storage Memory. If this button is enabled tap it to move the app to storage memory. If the button is disabled (grayed out) it means that iBird on your device can’t be moved to storage memory. As developers we can only suggest to Android where to install your app, but the final decision is up to the device itself. If the problem is that you do not have enough room in app memory for iBird and you are unable to move it to storage memory the only solution is to remove one of the your other apps to make room for it. You can go to the Settings->Applications->Manage Applications menu and sort if by Size to see which of your apps is taking the most room. Then uninstall that app and try to install iBird again. I had this problem with my older Motorola Droid. I had to remove the Audubon app before I could get iBird to fit. In both the case of iBird and Audubon the app would not install in SD Card memory. 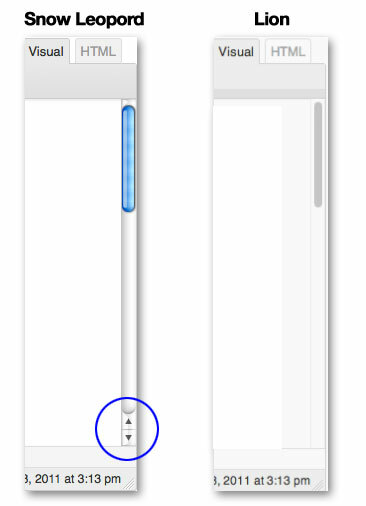 How do you feel about Lion’s scroll bars? Please take this poll. Please read my blog post called “Missing Steve Jobs Magic Touch” then come back and take this poll. 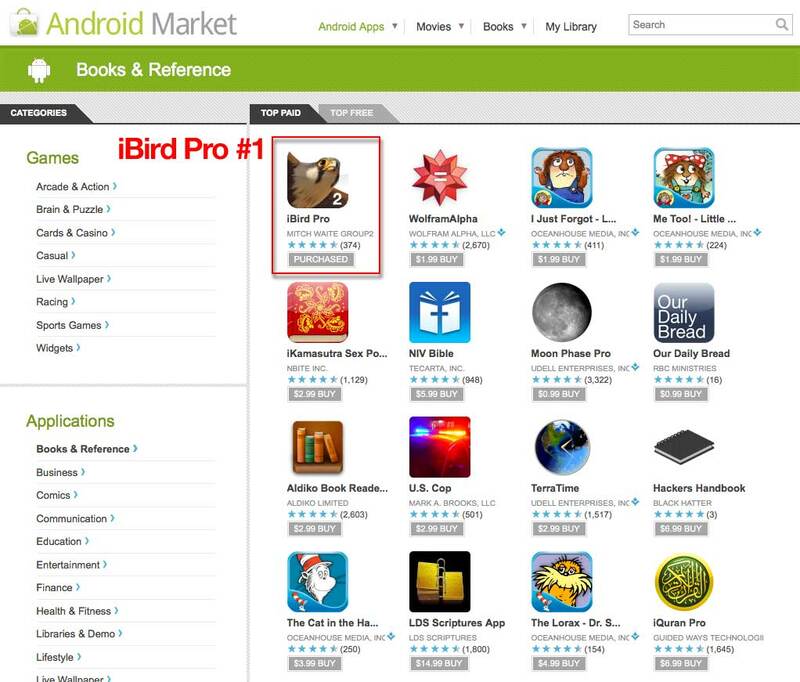 Note: The iBird Android apps are now working and in the Google Market. If you have a support issue please go to this page and fill out our support form. Contact iBird Support If for some reason you can’t use that form you can try support at ibird dot com. The Brittany Spears concert sells out in 10 minutes and the ticket master web site crashes. President Obama implores the American people to let “your Member of Congress” know they want a “balanced approach to the budget” and at least nine Web sites for House and Senate leaders go down. Target’s web site comes crashing down as Missoni-loving fashion devotees scramble to buy the high-end Italian designer’s clothes for a song. While this drives us crazy there is one positive side effect; someone did something right to cause all the attention. I Want My iBird NOW! Those of you who tried to upgrade the iBird Pro for Android in the Google Market on Wednesday felt the pain as the database took a ridiculously long time to synchronize. I’m writing here today to apologize for this unintentional faux pas and to let you know we are doing all we can to fix the issue and explain what caused it. The reason for this, to cut to the chase, was the was much higher demand than our server could keep up with. Why? Well this particular update to iBird made it compatible with a large number of Android tablets launched in the last year. Up till now the app only worked well on smartphones with small screens. This version also contained brand new high res 720p illustrations and photos. These made the database about twice as large as the previous version. So unbeknownst to us the number of customers who had new tablets and wanted to update was huge so within a few hours of the apps appearing in the Google Market our web server slowed to a crawl. Updates of the database, which normally take no more than 5 minutes to an hour and a half were taking several hours. At first we thought something was wrong with the program. Which was a shock because we’ve spent the last 8 months testing this app over and over until we were sure everything was working great.Whats that saying about an ounce of prevention? The only thing we could do at this point was to plug the dike meaning put a stop to the number of people getting caught in this mess. So we unpublished the Pro and Lite apps. We didn’t remove Yard since we had not updated it but its not designed yet for tablets. Hence the double-sided coin of pain and pleasure alluded to in the beginning of the story: people love our app more than we ever imagined. Which feels great. But at the same time people have become so dependent on iBird that there’s this huge pressure to keep it running perfectly all the time. While we are addressing disappointment let me get this out of the way. iBird is not going to work perfectly on all tablets. Yep you heard that right. A myriad of reasons. For one with the introduction of the tablet the app has become much more complicated. In this current 2.0 update we have made it so iBird “adapts” to different screens resolutions. That might not sound like much much but it’s a really tough thing to get right. You see the so-called Android “standard” is actually a patchwork quilt of different versions. In fact Google has revised Android at least five times in the last three years. And they have created 3 different Android OS’s, one for smartphones, one for tablets and one for televisions (what you have not heard of Google TV?). Each time Google revises the OS it means that things that once worked fine may now break. As far as Google is concerned it’s the responsibility of developers to keep up with these OS changes. On top of these changes in the OS we have carriers trying to differentiate their devices from other companies. They accomplish this by making changes to the hardware and the software itself. These changes make each Android device work different than others. There is literally an “arms race” among carriers as they try to make their device better than the other guys. Caught in the middle are developers, like ourselves, who have to make sure their apps can still work on all these devices. Let me tell you its a huge mess. Indeed there is a company called Device Anywhere which has a web site that emulates all the different Android devices on the market. Developers can rent time on their site to test their apps, but trust me it’s not cheap (hundreds of dollars an hour) and it’s so in demand you have to make an appointment to test your app. Nice business to be in but the point is the poor developer is caught up in this ever changing landscape of hardware alternations. I know some iPhone developers who actually refuse to port to their apps to Android because they can’t justify the amount of work required to keep the app up to date. With iBird we have tested it on at least 50 different devices. We know there are some Android devices which iBird will not work on. But since Google gives you 15 minutes from the time you make a purchase to the time you can get a refund we recommend you take this time to download the smaller iBird Lite and see if it will work on your device. If it wont then please cancel your order and get refund. Otherwise you have to wait while we try to figure out why iBird won’t run on your Optimus Trend Setter Tablet. How Long will iBird Syncing take with CDN? The time to sync iBird on the CDN network depends not only on the speed of the CDN network but also your WIFI and your ISP which your WIFI connects to. Its a chain. It starts with the CDN but then goes through these other pipes until it gets to your Android device. Here are the results I got testing last night using the GoGrid (re-purposed EdgeCast) CDN. This is on a Samsung Galaxy Tab 10 which is a very fast tablet. Now your own mileage may vary. Note that iBird Lite with only 30 birds downloaded them all in 5 minutes, meaning about 6 per minute while iBird Pro with 924 birds downloaded them all in 90 minutes meaning about 10 per minute. Why? Because with so many more birds iBird Pro has more time to take advantage of the bandwidth and therefore represents a more realistic average. The bytes downloaded per minute is around 6 MB (550 MB / 90 min = 6.111 MB / min) or about 100K per second. This is pretty fast by most internet standards. But again it is going over WIFI and that puts a pretty good bottleneck in the speed. Here are the results I got testing the Maxcdn CDN today. This is on a Samsung Galaxy Tab 10 which is a very fast tablet. This is the CDN we finally settled on. iBird Pro 924 2-1/2 min 27 min 550 MB 34 !! Note the time to sync Pro went from 90 minutes on GoGrid to 27 minutes on Maxcdn. So the birds downloaded per minute went from 10 to 30. That’s 300% faster! The bottom line here is the CDN will vastly improve the download time of iBird. We can’t promise you will get the kind of speed we did but hopefully it will be way better than the hours it was taking last week.